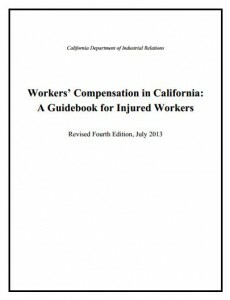 The California Department of Industrial Relations just issued a revised fourth edition of the “Workers’ Compensation Guide in California: A Guidebook for Injured Workers.” This 94 page document is chock full of information employers should also know. There are two significant changes worthy of note in our brief summary: 1) How employees can predesignate a physician for work related injuries and illnesses, and 2) how employees can resolve problems when they do not agree with workers’ compensation related medical care and medical reports. ” I want to select my physician before I’m injured.” Employers are required to offer most employees the opportunity to predesignate a personal physician or medical group before they are injured. However, employees may only predesignate if they have health care coverage for non work related medical conditions (i.e., either group or private health insurance). Employees who do not have medical coverage do not have the right to predesignate a physician for a work injury or illness. Most employees will predesignate their physician on DWC form 9783. If the employer or insurer has a contract with a health care organization (HCO) then employees must use a different form (DWC form 1194 and also available from the insurer) to predesignate their physician. The Physician Predesignation form should be given to all new hires. Employers with HCOs are required to give the DWC form 1194 to new hires and at least once a year. We recommend that the Physician Predesignation form 9783 for employers with MPNs be given to employees annually as well. The Guidelines outline the option for employees who wish to change their primary treating physician after treatment begins. We’ll not go into that detail here as the document does this nicely. An HCO is an organization certified by the state Division of Workers’ Compensation to provide managed medical care to injured workers. (There aren’t a lot of these being used currently and these are different from the Medical Provider Networks (MPN) offered by insurers.) Employers should check with their insurers to clarify if and which type of service is available to injured workers. “I don’t think this is the right doctor for me.” Employees who wish to dispute their treatment may take steps to obtain a second or third opinion. The route for this varies based on whether the employee is in an MPN or HCO, or neither. An employee treated by a doctor outside an MPN or HCO may also request to change physicians, but must work through the insurance claims adjuster within 20 or 30 days, depending on the employee’s legal representation. We encourage employers to work closely with their workers’ compensation insurance carrier before work related injuries occur. These are complicated and voluminous regulations that require a hands on expert. This quick overview is not intended to be legal advice.